CognIoT™ continues the theme of offering a great OOB (out of box) experiences for Pi based RFID readers. Just plug the NFC reader into your Pi and it will be reading tags even before you have run any software on the Pi. Add software (example code provided) to turn your Pi into a powerful NFC reader and interact with tags or NFC enabled phones. The NFC Reader supports all of the common NFC standards based on ISO14443A. The standards are often referred to as NFC type 2, MIFARE Classic® MIFARE Ultralight®, MIFARE DESFire® or NTAG2. Communication is via the Pi’s UART so not even a low level driver is required to get the Reader up and running. The Reader provides a powerful command structure through the Pi’s UART allowing the Pi full control of its extensive capabilities. o Reader works without the need for low level drivers to be downloaded and compiled. o MIFARE Classic® 1k card (MF1 IC S50 transponder) and equivalents. 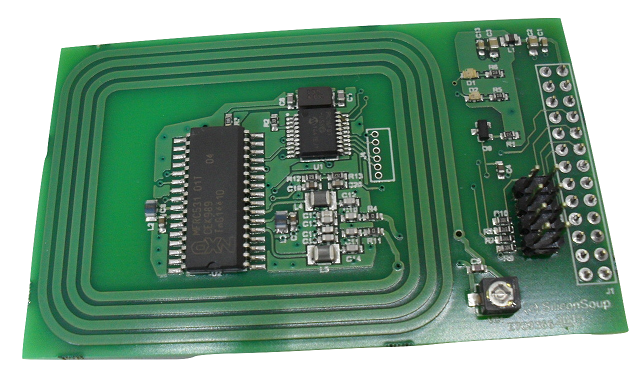 o MIFARE ProX, Smart MX (JCOP) dual-interface card types are supported to allow single or double UID to be acquired and “MIFARE” operations performed across the contactless interface. MIFARE DESFire®, MIFARE Plus® supported for serial number acquisition. Data transfer at 106KBaud. Typical read/modify/write operating in about 100ms. LED indicates tag read. Optional Beep signal available to provide audible feedback of a read/write.